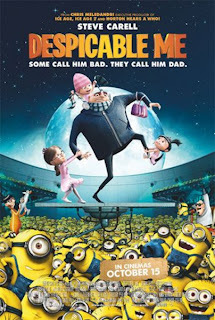 Gru (Steve Carell) is one of the oldest villains in a happy neighborhood. And although he steals things, his attempts doom to fail, successfully at that. So when he wanted to prove the world that he can perform the biggest burglary known to man, that is, STEALING THE MOON, he can never be defeated. Unfortunately, a new villain rose in the name of Vector (Jason Segel), who stole the Great Pyramid of Giza, became his greatest rival for the "Number One Villain" spot. He swiped Gru's ideas and stole the shrinking machine that Gru will have to use to finally get the moon. But to plot his revenge, he has to adopt three girls, Margo (Miranda Cosgrove), Edith (Dana Gaier) and Agnes (Elsie Fisher), to actually pull off the scheming tricks of Vector. Little did he knew, he was getting attached to the kids and slowly turning into a dad, in his own way. Will he actually manage to steal the moon and do his fatherly duties at the same time? Watch Despicable Me in 3D and be amazed of the cutesy yet impressive graphics. I definitely and adorably give five stars to this movie. Although the characters have been conniving on most part, I actually loved Gru and how sensitive he is for the children. I loved how he delivered the line "The physical appearance of the please makes no difference. ", when Agnes wanted him to read a bedtime story. And despite his villain ways, he proved to be soft in the end and how he loved them. Steve Carell made him funnier than ever. My most loved character is Agnes. "It's so fluffy I'm gonna die!!" is stuck inside my head, I don't know how to get it out. It would probably stay for three days tops. Gru's minions were also very cute. I cant understand a word they're saying, but they give life to the movie nonetheless. Oh and Julie Andrews voiced Gru's mother. I think she loves doing voice-overs nowadays. I cried at the end of the movie, not because of the 3D glasses, but how it touched me to see Gru finally being a real dad to the kids. Scenes like those make me wish that my Dad could've read me a bedtime story or pull me out of a flying rocket, or blast off a carnival game just to give me a fluffy unicorn. Thanks again to Az, Ms. Tinay Magtira of Megaworld and Resorts World Manila for the wondrous 3D Experience.